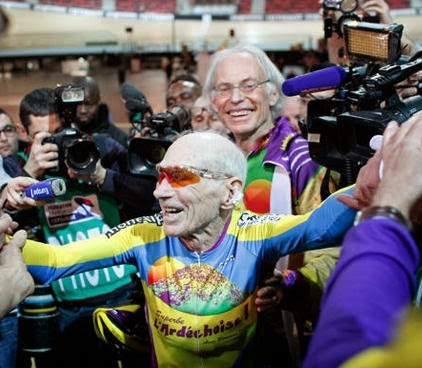 1st State BIKES: 102-year-old cyclist sets world record! (AP) -- Age hasn't slowed cyclist Robert Marchand. The 102-year-old Frenchman broke his own world record in the over-100s category Friday, riding 26.927 kilometers (16.7 miles) in one hour, more than 2.5 kilometers better than his previous best time in the race against the clock two years ago. By way of comparison, the current overall world record for one hour is 49.700 kilometers (30.882 miles) set by Czech Ondrej Sosenka in 2005.